If you don't have experience in the arena of contingent-fee law firms, then you may wonder exactly how they make money if they happen to lose a case. The answer is that they don't. There is no catch with contingent-fee law firms. If they lose the case, they don't get paid. This can be a difficult process for contingent-fee trial lawyers who are trying to make it in a business that's often unforgiving. Indeed, some trial lawyers may wonder how they are going to fund their initial case. What happens in the event of a string of negative outcomes? How do they secure capital for future endeavors without slipping into consistent debt? In How David Beats Goliath: Access to Capital for Contingent-Fee Law Firms, Michael J. Swanson answers these questions for trial lawyers who work on a contingent basis. He wrote the book with support from his business partner Dan Taussig and his close friend and now literary agent Harlan Schillinger. Since 2000, Swanson has been the CEO of Advocate Capital, Inc. -- a law firm financing agency based in Nashville, Tennessee. In his time at the helm of Advocate Capital, Inc. he learned about the intricacies of law firm financing and the struggles that contingent-fee law firms face. He also learned that, while trial lawyers have a firm grasp on all things legal, they may be lacking in accounting and financial knowledge. Swanson's background in the law firm financing industry, and his belief in the work that trial lawyers do, spurred him to write the book and publish it in 2011. Trial lawyers around the country owe him a debt of gratitude for doing so. The book is succinct and clear in its goals. At only 139 pages, it only takes a day or two to finish and it's packed with countless nuggets of financial information that can help contingent-fee law firms stay afloat and thrive. It addresses the major problems that trial lawyers face and how they can go about fixing them. For instance, one of the most apparent issues plaguing trial lawyers is the fact that they have to fund everything for a trial, including videographers, witnesses, and experts without any guarantee of a return on their investment. Even in very winnable cases, trial lawyers may struggle to secure capital that could make winning the case a sure thing. Before Swanson gets into the nitty-gritty of securing capital, he makes it a point to deliver some accounting knowledge to trial lawyers. Concepts like the "time value" of money, assets, capital, and income statements may be foreign to many contingent-fee law practices. Swanson clearly believes that a well-capitalized law practice is one that has a better chance to improve cash flow. Swanson's final form of funding, loans with interest pass-through, essentially allows law firms to borrow money from a third-party lender on a case-by-case basis. Although it's the least expensive option on his list, it's not the most commonly used one. In fact, self-financing (partner's cash) is the most common just ahead of opening a basic bank line of credit. 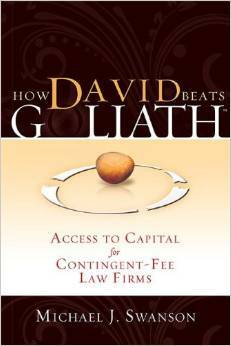 The strategies for securing funding in How David Beats Goliath are worth every penny for contingent-fee law firms. Michael Swanson writes from experience, passing on his wealth of knowledge to those who can best utilize it. If you operate a contingent-fee law firm, then you'll benefit from this quick read.